Your LabLynx solution readily integrates with any other application, database, agency or device/instrument that is capable of being interfaced. LabLynx offers interfacing options to meet whatever your needs dictate. You can include integration services in your initial scope or request them at any other time through the help desk. 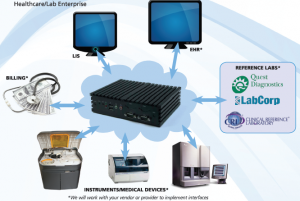 Connect your laboratory information system (LIS) to your electronic health record (EHR) so that patient information, assay requests and results are shared and automated. Also link instruments to the LIS so that requested assays are communicated to the instrument and results returned automatically to the LIS for review and reporting. These and any other integrations—e.g., to billing services, reference labs, or a patient portal—are readily available, with many channels already in service for other customers and more released every day. Whatever it is, your integration plugin will be custom-configured to your unique needs. For whatever integration needs your particular lab has—e.g., LOINC or SNOMED LIMS integrations for your environmental or water lab, chromatography devices, agency reporting systems—or any other kind of lab requirements you have, LabLynx will meet them for you.